Mt. San Jacinto State Park encompasses the mountain of San Jacinto and surrounds the mountain town of Idyllwild. Better known as the mountain that towers over Palm Springs or the mountain that you take the tram to, Mt. San Jacinto has a summit of 10,834 feet and is protected by both the San Bernadino National Forrest and the Mt. San Jacinto State Park. 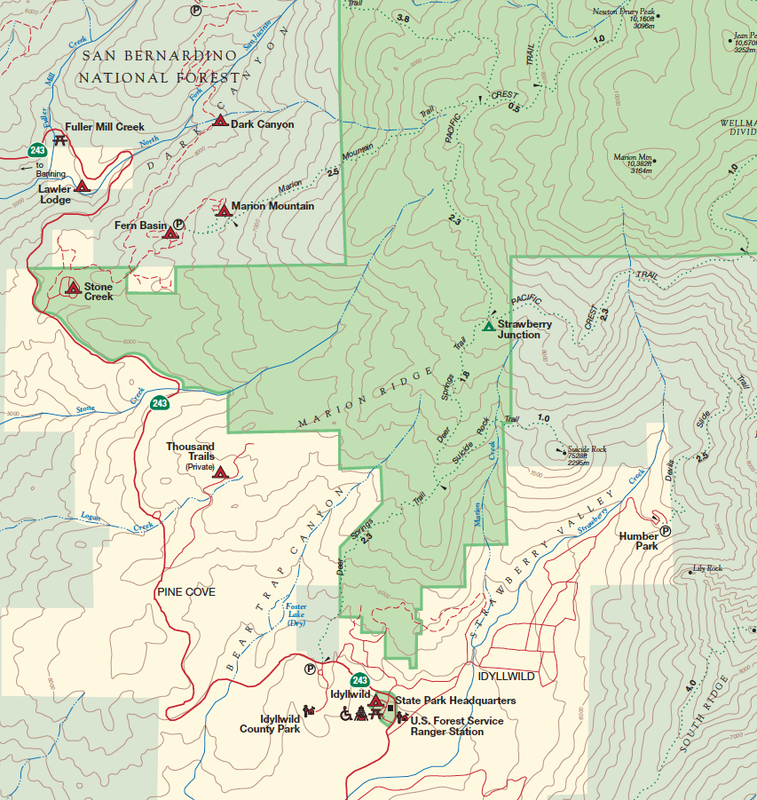 There are over 10 campsites throughout the area, some within the state park and some within the national forrest. 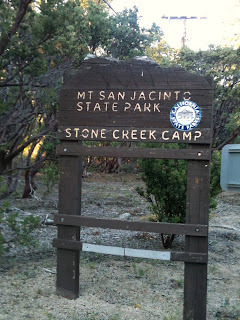 For this trip, we stayed at the Stone Creek Campground, one of the two developed campsites within the state park. Stone Creek campground is a relatively small 50 site campground about 6 miles away from downtown Idyllwild off of SR 243. The easiest way to reach the campground is to take Interstate 10 to Banning, where you will exit on SR 243 going South. The 243 is a very small and windy road, and it scales the northern face of the mountain that rises straight up from the desert floor. Be careful and drive slowly and safely. After you climb the mountain, the turn to the campsite can be easy to miss at night since the sign announcing the turn off the highway isn’t very big, so turn around if you hit the small town of Pine Cove to the south or if you pass Lawler Lodge to the north. State Parks usually leave their campgrounds open throughout the night, meaning if you don’t get off work until late then you can still arrive after hours, which meant 12:30am in our case. Don’t forget to check in with the camp host if you arrive during standard hours. Keep in mind that Stone Creek is a different campground then the Idyllwild campground (see Map above). Although both are administered by the same state park, they are nothing alike each other. Stone Creek is about 6 miles from the actual town of Idyllwild, while the Idyllwild campground is right next to the main ranger station in town. Also, Stone Creek is less developed, meaning amenities such as showers are only available at the Idyllwild campground. Firewood can’t be brought in, so you’ll have to shell out the $6 per bundle (don’t hold me to that number, it’s subject to change). The high elevation means that the campground is seasonal, usually open from early April to late September, so make sure to check the Reserve America website to make sure the campground is open. Stone Creek campground reservations are open through mid-September, after, first come – first served camping available based on weather (snow) conditions. If you can’t see the map, the full PDF version can be found here. The hike I decided to tackle on this trip was the Devils Slide Trail. Although it looks easy on the map at only 2.5 miles, it actually gains 1,600 feet in elevation, bringing you to Saddle Junction at the top. It’s a doable hike, but be prepared for a decent challenge if you aren’t accustomed to it. Don’t forget your water, the temperature is usually in the 90’s during the summer months. If you’re not looking for too intense of a hike after scaling Devil’s Slide, I highly recommend is to take the pacific crest trail south from the Saddle Junction towards Tahquitz Peak. Otherwise, there are other trails that can take you all across the mountain and up to the various peaks. 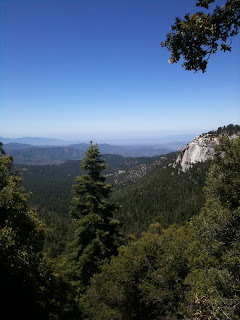 Personally, I was content with finding rocks overlooking Idyllwild to lay out and sunbathe on. If you’d rather stick nearer to the campground, the Marion Mountain trail starts a short drive up the forrest service access road from the campground. Don’t forget to get your hiking and wilderness permits from the forrest service office in Idyllwild! 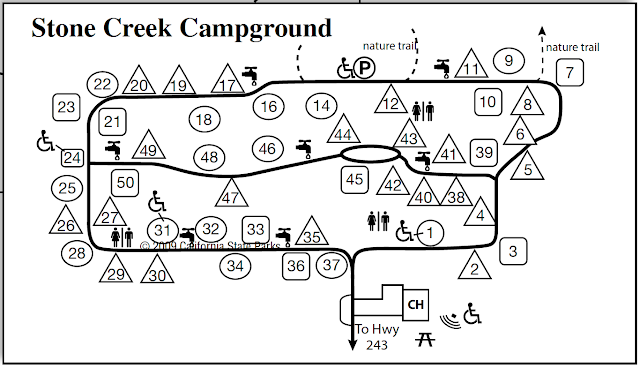 The campground is shaped exactly like the map above, except that it is laid out on the side of a hill and is relatively well spaced out. The middle road, campsites 38-50, are the sites to avoid, for they all have relatively little privacy and are generally close together. Sites along the fringe of the campsite are the ones I would recommend, since they offer the most quiet and privacy. We stayed in site number 12, and although the map shows it to be right next to the bathroom and nature trail, it actually proved to be one of the best campsites, in my opinion, throughout the site. Since the campsite sits at an elevation of 5,700ft, the main vegetation is pine trees, although in a few sites additional shrubbery serves as a great separation. Bear lockers are also installed, but there was never any instructions or urgings from the hosts to put them to use. The only thing against this campsite were the flies, they got to be so bad that I made the ten minute drive to Pine Cove just to get bugspray. I don’t know if I just smelled particularly attractive to flies that evening or what, but don’t forget the bug-spray. Overall, Stone Creek was a great campsite, and our campsite was very private and quiet. The surrounding State Park and national forrest hikes are well worth the effort, and the town of Idyllwild is filled with cool diners and shopping. Again, don’t forget the bug-spray! Reservations can be made here, or click here to visit the State Park’s website. How would you rate this campsite for star gazing? Is the sky visible at night through the trees? It’s not the greatest, but it also depends on the site you have. Most of the sites are situated well within the trees, but there are always the sites that have a view of the sky. Also, even though you’re pretty far from the city, the lights from San Bernardino and Riverside make for a pretty polluted sky on the mountain. How was the afternoon shade in Site #12? Hi Karen, from what I remember it was in shade almost the whole day (save 9-11am or so). There’s a giant tree at the base of the campground that provides shade continuously from noon onwards. It’s been a few years since I’ve been there, so no promises it’s exactly the same. If you stay at site #12 make sure to let us know how it goes!